Our Medical Imaging department is part of the Joint Department of Medical Imaging (JDMI) comprised of Women’s College Hospital, Mount Sinai Hospital and the University Health Network (Princess Margaret Hospital, Toronto General Hospital, Toronto Western Hospital and Toronto Rehab Hospital). At Women’s College Hospital we provide and support imaging and interventional services in an ambulatory (out-patient) care environment. We are fully affiliated with the University of Toronto and are actively engaged in advancing diagnostic practices through research and academics. Our work is focused on improving and advocating the health of women as seen through our recent MSK Ultrasound and Virtual Colonography initiatives. We also boast one of the province's first Large Bore MRI Scanners. With its larger than normal opening, this scanner provides more comfort for our patients. We also work closely with clinical services including Family Practice, to develop new ways of offering walk-in patients access to same-day diagnostic scans. Our inter-disciplinary staff work closely and professionally to provide quality diagnosis, assessment, planning and treatment for our patients. We are also leading several eHealth innovations, software development initiatives and regularly updating clinical practices to align with current best industry standards. A referral from a physician is required. 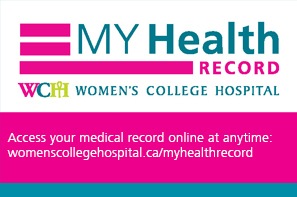 The MRI Request Form is PDF writeable enabling external referring physicians to type directly into the form, print, sign and fax to Women’s College Hospital. Typed requisitions will improve overall legibility and completeness of the forms we receive. Please note this electronic version cannot be populated and saved, but must be printed, signed and faxed to the appropriate number indicated on top of the form. Highlights how each component of the MRI request form provides key information to help us serve your patient. Outlines strict criteria that will be utilized by the JDMI booking departments to determine acceptance of submitted paper requisitions.